4k00:18Feuerkogel winter resort is famous among the sportsmen and tourists, enjoying its snowy slopes with nice ski runs, snowshoe trails and cable car network, Ebensee, Salzkammergut, Austria. 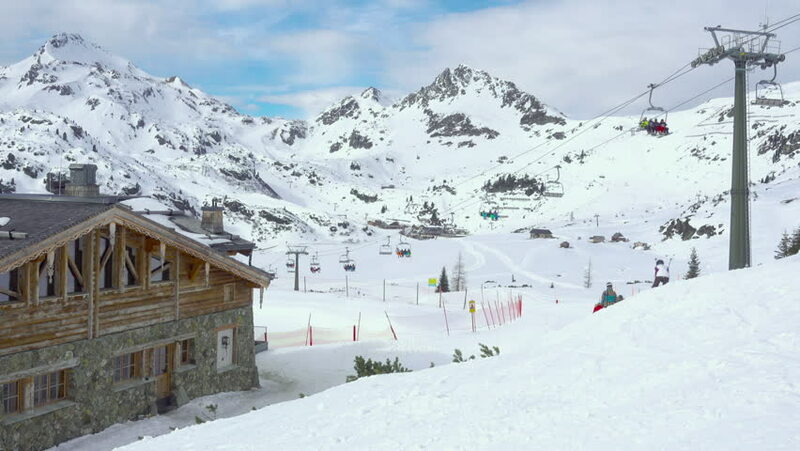 hd00:24Ski station on the background of mountain peaks. People ski, climb the cable car and descend the slope. 4k00:10Ski resort Kraliky in Slovakia. 4k00:21GOSAU, AUSTRIA - FEBRUARY 26, 2019: The chairlift, riding along the snowy slope of Zwieselalm mount, with a view on peaks of Dachstein West Alps on the background, on February 26 in Gosau. hd00:20NIIGATA - FEBRUARY 28th: Skiers and Snowboarders enjoying the slopes on February 28th, 2012. Niigata is popular in Japan during the winter period with tourist from Tokyo to hit the slopes. 4k00:22Colorado, USA-January 7, 2018-POV-Kids and adults learning to alpine skiing on bunny hill at Arapahoe Basin ski resort.